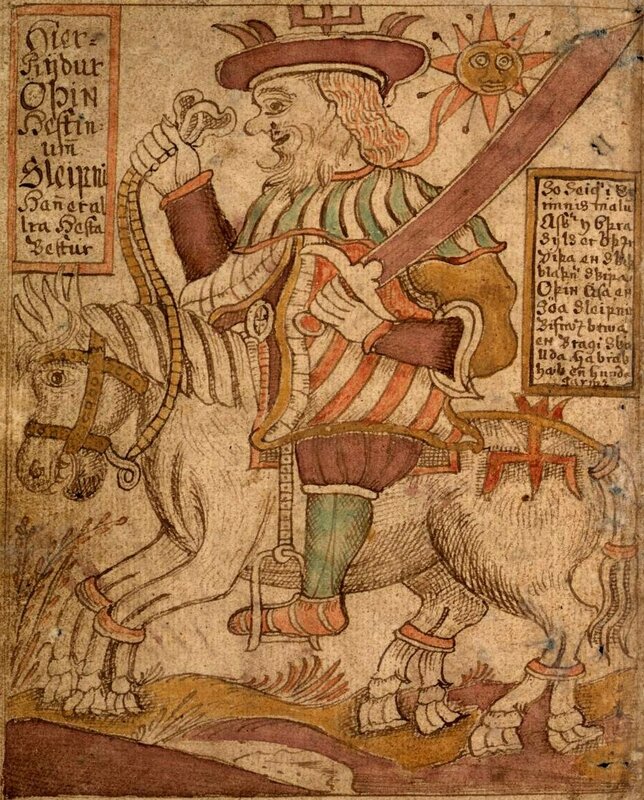 Known as the Father of Men or All-Father, Odin was the god of poetry, secret wisdom, and magic. He gained his wisdom by drinking from one cup from the Well of Mimir, in which all wisdom was stored. In exchange for having this drink he had to give up one of his eyes. He was also a god of war, and would join battle wielding a spear named Gungnur and riding a eight-legged horse named Sleipnir. Odin’s wife, she is considered the foremost of the goddesses in the Norse pantheon. While she has the ability to predict the future, this does not save her son Baldr, who was the most eloquent and gentle of the Norse gods. Frigg reveals to Loki that Baldr’s only weakness is mistletoe, and Loki uses this knowledge to fashion a dart out of the plant and then trick the blind god Hod into shooting and killing Baldr with it. Tyr was the god of justice and war. He would sacrifice his arm so that the wolf Fenrir (an offspring of Loki) could be bound up in an unbreakable chain. The goddess of love, she rides on a chariot pulled by two cats and keeps a wild boar beside her. Freyja rules over her heavenly afterlife field Fólkvangr and there receives half of those that die in battle, whereas the other half go to the god Odin’s hall, Valhalla. The god of poetry. Snorri Sturluson writes that “he is renowned for wisdom, and most of all for fluency of speech and skill with words. He knows most of skaldship, and after him skaldship is called bragr, and from his name that one is called bragr-man or -woman, who possesses eloquence surpassing others, of women or of men.” His wife, the godddess Idun, is the keeper of the apples of eternal youth, which keep the Norse gods from growing old. He is the gods’ watchman, guarding Asgard, the realm of the gods, from the frost giants. Heimdall lives by the Bifrost, a rainbow bridge that connects Asgard with the world of men. Snorri writes that “he needs less sleep than a bird. Night and day he sees a hundred leagues away; he also hears it when grass grows on the earth or wool on sheep or anything else that can be heard. He has a trumpet called Gjallahorn, whose blast can be heard in all the worlds.” When Ragnarok occurs, Heimdall will use this horn to sound the alarm, and will then face Loki in a final battle, where they will kill each other. The offspring of a giant and a goddess Loki is a kind of trickster figure. At some points he helps the other gods, but at other times could cause trouble and suffering. He can shape-shift into many forms, and if something is stolen or goes missing in Asgard, Loki is usually blamed. He also had three offspring, all monsters: the Midgard serpent, the wolf Fenrir, and Hel, goddess of the underworld. The god of archery. Snorri Sturluson writes that “he is such a good archer and ski-runner that no one can rival him. He is beautiful to look at as well and he has all the characteristics of a warrior. It is also good to call on him in duels.” Saxo Grammaticus notes that Ullr (whom he calls Ollerus) at one time replaced Odin when he was an exiled, but when that god returns Ullr is exiled and then killed. The medieval writer added that he was a cunning magician who could travel across the seas on a bone.